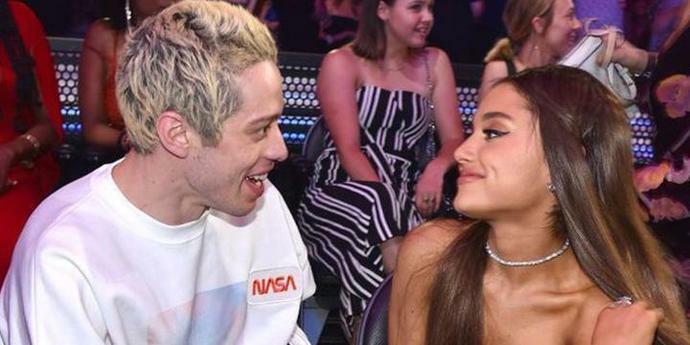 Mac Miller's death sent his ex of two years, Ariana Grande, into a downward spiral and may have played a role in her recent split from fiancé Pete Davidson. The pop star, 25, and Saturday Night Live actor, 24, started dating in May - the same month it was confirmed she'd ended things with the rapper - and they were engaged by mid-June. On Sept. 7, Miller died at age 26 from an apparent overdose, and this past weekend, Davidson and Grande broke up. A source close to the "No Tears Left to Cry" singer told PEOPLE that "It's true that Ariana has been struggling a bit with life in general," after her ex's death, adding: "It was devastating and shocking to her. It's had a huge, negative impact on her life. It made her rethink many things in her life." One commitment she ended up reassessing was her imminent marriage, the insider continued. "She realized that planning a wedding right now felt very rushed. It's not what she wants to do right now. She doesn't want to make any rushed decisions and has decided to take a step back instead." Added a source close to Davidson, "They're dealing with things that people wouldn't have to deal with in a lifetime - an ex-boyfriend reportedly overdosing and having all of this fame and attention. These followers and living their lives on social media … it's a different world." In the wake of Miller's shocking death, a source told PEOPLE that Grande "completely broke down after she found out about Mac… She can't believe he isn't here anymore. He was such a special person to her. She is very, very sad. … This is a nightmare for her." The day after the loss, the "God Is a Woman" singer honored him on her Instagram account, posting a black-and-white photo of the rapper without a caption. A week later, she was ready to open up about how much Miller meant to her. "i adored you from the day i met you when i was nineteen and i always will," she wrote on Instagram, alongside a throwback video of the pair laughing together. "i can't believe you aren't here anymore," she added in the emotional post. "I really can't wrap my head around it. We talked about this. so many times. i'm so mad, i'm so sad i don't know what to do. you were my dearest friend. for so long. above anything else. i'm so sorry i couldn't fix or take your pain away. i really wanted to. the kindest, sweetest soul with demons he never deserved. i hope you're okay now. Rest." According to a close friend of Miller, the pop star was incredibly involved in and effective at helping him stay sober. PEOPLE confirmed on Sunday that Grande and Davidson had ended their engagement, with a source explaining that "It was way too much too soon. It's not shocking to anyone." "I have, like, a basement that's mine," the 'SNL' star revealed to Jimmy Fallon.